“What is the best business to start from home”? And I find myself responding in the same way to all of the above questions. In my mind, it is simple. There IS a way you can start your own business (that belongs to you and not someone else) from your own home, by yourself, for very little money. The answer is AFFILIATE MARKETING. Online sales have never been bigger. I want you to understand how big online shopping is to appreciate how lucrative affiliate marketing can be. Let’s take a look just at this past Black Friday weekend of sales in the United States alone. Black Friday, November 23 2018, saw a total of $6.2 billion in sales. The predicted sales were $5.9 billion. Year on year growth was 23.6% from 2017. Cyber Monday 2018 hit $7.9 billion in sales yesterday, a 19.3% year on year increase from 2017. It was the biggest online shopping day in U.S. history. Consumers are more and more comfortable buying online. Retailers are strengthening and expanding their affiliate programs so that affiliate marketers can market their products on their behalf, allowing them to slash their advertising budgets. The really successful retailers are those embracing the online world and creating lucrative affiliate programs, rewarding those affiliate marketers who do the heavy lifting for them. 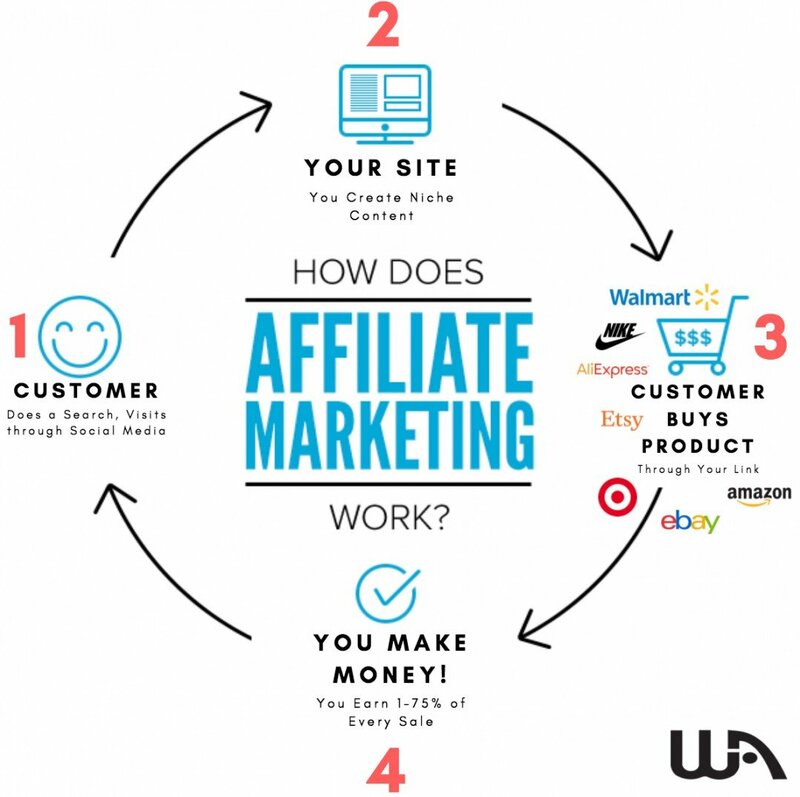 If you don’t know how affiliate marketing works, the concept is straight forward. Basically, a customer does an online search for a product, or sees something on social media that entices them to click on a link. They end up at your site. They see the content and product that enticed them to your site, and they click on it. The customer goes to the website that actually sells the product – this could be any site that you link to that you are an affiliate of, such as Amazon, Walmart or any other affiliate site – there are literally thousands of sites that have affiliate programs. The customer purchases the product, and you make a percentage of money from the sale as the affiliate. The idea is that this process is on repeat, 24/7, with products continually sold as a result of people visiting your website. You never have to purchase the product, or ship it. You don’t need to handle any of that. There are 3.75 BILLION people online as of 2018. These people are your audience, and they are searching for things all the time. They are looking for information, solutions to problems and to buy stuff. That is where you, as an affilate marketer, come in with your website and help these audiences by offering them information about what they are looking for. You will be helping these people, and you earn revenue in the process. Anyone can do this. I mean ANYONE. I’d never built a website before. It never even occurred to me that it was something that I could do. That wasn’t my background at all. Yet here we are!! Tap into the fastest growing business platform in the world, the Internet. With affiliate marketing, you can capitalize on any idea, interest, or passion that you have. No experience necessary, no product required. Turn your love of something into a lucrative business. The sky truly is the limit for us as affiliate marketers. The potential is infinite. Got questions? I’m always happy to help. Drop me a note below and let’s get the conversation started.